BitStarz is a fashionable online casino that is rapidly gaining momentum. Unlike many other bitcoin casinos, here to play your favorite games you can use not only bitcoins, but the usual currency, for example, the EUR or USD. BitStarz are one of the first online casinos, which began to offer the possibility of playing for real currency along with bitcoins. Regardless of the chosen currency that you will use, your transfers will all be as simple, fast and convenient. And of course in the game you can get a lot of juicy bonuses. BitStarz opened in 2013, initially the casino was called slightly differently – BitStars Casino, but in the second half of 2014, having decided to conduct a small rebranding, they changed the last letter in their name. Here you can fully appreciate the collection of world-famous games (there are already more than 850) from the most sought-after developers around the world, among which stands out Betsoft, NetEnt and Microgaming. Join today, you can fully enjoy the welcome package of bonuses with a total of 5 BTC or € 500 and 180 frisinas, as well as other promo promotions! Immediately noticeable that the design of the site looks very high quality and thoughtful, all the essentials are on the main page in plain view and each player can easily figure out how to use the site and be able to customize it for themselves. All the top navigation of the site together with cash register buttons, balance and account settings are always visible, even when scrolling down, as well as the auxiliary buttons on the right Winners and Help. After clicking on the Winners button, you will see information about the last winners, the top biggest winnings and the list of the game with the greatest progressive jackpots. We advise you to check all three bookmarks more often, in order to always be aware of what games are “giving” at the moment and in which you can break a solid amount by winning the jackpot. And when you click on the second Help button, an additional menu opens with a description of all available payment systems with minimum and maximum limits, a list of frequently asked questions and a live chat button. Just below the left is a very convenient and useful sorting by the types of games and their developers. If desired, you can put all your favorite games in a separate folder My Favorites, so that in the future you do not have to waste time searching for the game. In a lot of functionality on the main page there is a small minus – the site can be a bit slow to load on old computers, but it is not so critical. In the casino there are all the most popular and popular game developers: NetEnt, MicroGaming, BetSoft, Amatic Industries, SoftSwiss and Ezugi. 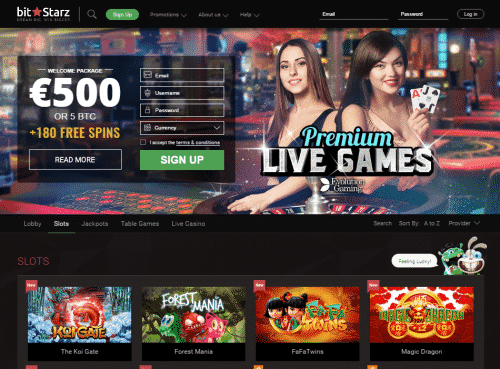 Among the huge list of all the games you’ll find are roulette, slots, poker, and of course you should not forget about games with live dealers, blackjack, progressive jackpot games and other gambling games that no good casino can do without. Immediately after registering a game account, hundreds of free games will be available to you. Be sure to try playing the most popular Slots of BitStarz Casino: Gonzo’s Quest, The Slotfather, Starburst, Wild Shark, Fortuna’s Fruits, Terminator 2, Immortal Romance and many, many others. BitStarz Casino is a subsidiary of Nabelse Holdings Limited, which is regulated in Curacao. The casino also has a certificate of correctness of the RNG and boasts a reliable and trustworthy gaming policy. It has already been proved that their games are completely honest and fair, if desired, absolutely anyone can check it at any time. On the Bitstarz website you can learn in more detail which of the offered games are available with the possibility of this test (provably fair). Sitting in your comfortable chair and playing BitStars, you can completely relax, as you will be sure that all your financial interactions with the casino are completely safe and anonymous. The casino uses only the most advanced technologies for data encryption, and their additional protection measures can withstand any cataclysm. Thus, your first four deposits can bring you in total not only up to 5 bitcoins of bonus, but 180 frisinas, and every next Monday you will be offered to make a deposit that activates a 50% bonus reload bonus up to 250 mBTC / € 35. The bonus is available within 30 days from the moment of its accrual, and the wager conditions are x40, which means that the bonus amount must be scrolled at least 40 times, after which you can withdraw it. Please note that some of the bonuses may not be available to players in certain countries, including Russia and Ukraine, so it is advisable to check the conditions for obtaining a bonus before you make a deposit. In addition, for registering a gaming account you get 20 free spins! But that is not all! In addition to the welcome bonuses, you will also be offered various additional promotions, for example, weekly bonuses for re-deposit, monthly tournament races (Slot Wars, where the prize pool of the current month is as much as 5 bitcoins / € 500) and numerous frisinas and no deposit bonuses. Bitstarz is certainly one of those casinos, on which you must necessarily have a game account to look not only at new promotions, but also for mailings with exclusive offers. In the BitStarz casino almost all major currencies are available including USD, EUR, GBP, NOK, SEK, CAN, AUS and of course bitcoins (BTC), which means the opportunity to increase the game bankroll using any of the above currencies, of course, making winning bets. Thanks to the large choice of payment systems and banking methods (VISA, MasterCard, Skrill, Neteller, PaySafe Card, Ukash, WireCard) that are available in BitStarz, you will be assured of the reliability and security in transfers and content on the balance of your gaming facilities. Like any online casino, BitStars has limits on the minimum and maximum amounts of deposit and withdrawal. At the minimum, you can make a deposit of 0.00001 mBTC (= 0.00000001 BTC) or 20 euros, and a maximum of 4,000 euros (there is no limit on the maximum deposit amount for bitcoins). All transfers to the deposit will of course be instant! The withdrawal of funds is also subject to restrictions – a minimum of 0.00001 mBTC or 40 euro can be withdrawn, and a maximum of 20 BTC times or from 4,000 to 8,000 euros depending on the payment system. Thanks to the special application Cubits you can make real currency exchanges for bitcoins or vice versa. But, as with registering a real money account, you will be asked to enter personal information, which will lead to the loss of anonymity of the game account. Thanks to the latest data encryption technologies, your winnings will be available for their subsequent withdrawal in just a few minutes, and sometimes immediately. At the BitStarz casino, you can also play through mobile devices and tablets. The number of available games is less than on the browser version of the site, but their numbers are regularly replenished with new games. Good feedback from players, fast response speed and efficiency are the most important and priority goals of the staff in supporting Bitstarz casino players. The support of the BitStarz casino cares first of all that whenever the players have any question, they can always get a quick and correct answer, and immediately go back to their favorite game. Be sure that the support will gladly help you with the solution of any problem, and you can get help using the live chat button at any time of the day. If for some technical reasons, live chat with the support will not be available, then you can always send your question using e-mail. It’s safe to say that BitStarz Casino provides the gaming audience with an excellent combination of a reliable online casino with experienced personnel and a variety of bonuses and promotions. The majority of players will appreciate all the work done and efforts, because it is because of them that your pastime in the casino will seem like an easy walk, without additional difficulties and troubles. It is on BitStarz that you can replenish the balance not only with bitcoins, but with real currency, as well as get additional bonuses and instant support in case of questions.